Is it possible to stop persistent bad breath (also known as halitosis) in less time than it will take you to read this article? 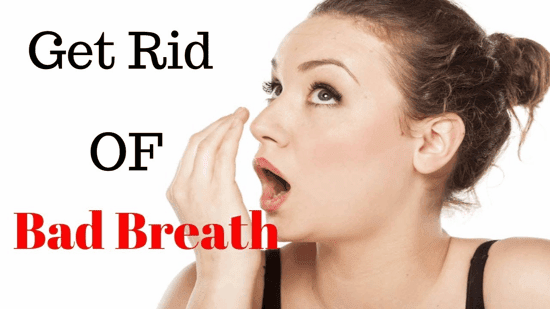 If you have been plagued with persistent bad breath, this article will provide you a simple, easy and fast way how to get rid of bad breath once and for all. The sad fact is bad breath is the #1 reason people go to the dentist. While halitosis can be a sign of more underlying issues that we’ll discuss later, more than 80% of bad breath can be eliminated by applying a simple two step oral hygiene technique we’ll explain in this article. We know, we’ve been there. We’ve had the persistent bad breath that makes you self conscious about talking in confined spaces and causes you anxiety of the possibility of a snuggle with your romantic partner. We all know that reaching for breath mints, with all their sugar or artificial whatever, serve as just a band-aid trying to cover up what a simple oral hygiene technique can eliminate so easily. Before we lay out this simple strategy, let’s take a quick look at the main culprits that cause bad breath. For a deeper understanding on the causes of bad breath, stay tuned for an upcoming article where we will dive deep into understanding each of these causes. Interestingly, there’s a common thread through many of these. Biochemically, a major contributor of bad breath is a high sulfur environment. (1) Lots of sulfur in the mouth can be simply caused by the classic ‘garlic and onions’ breath. You see, garlic and onions are high in sulfur (which is very good for you by the way). Also, the bacteria that live in our mouths (oral biome) produce sulfur rich compounds as a waste product from them living in our mouths. The bad bugs implicated with gum disease also produce this same sulfur rich waste while they undermine one’s oral health populating along and under the gum line. So, how do we reduce the amount of sulfur in our mouths? To grasp why this simple strategy works so well, it’s important to understand that 80% of the bugs that produce bad breath live on the tongue. These bugs thrive in an anaerobic (low oxygen) environment too. To help them create this low oxygen environment, these bugs create a scum (the polite term is biofilm) wherever they live which allows them to multiple even faster (which translates as more bad breath). The first step is to remove the scum from your tongue. If you have never cleaned your tongue, you are in for a rude awakening when you first try it. Cleaning the tongue can be done with a spoon or if you prefer to actually use a tool that’s been used for hundreds of years to clean the tongue, check out our awesome tongue cleaners. Can’t I just brush my tongue to clean it? That’s what we thought too, until we actually cleaned our tongues! If you’ve never cleaned your tongue before (and are into a bit of a spontaneous challenge), we invite you to go brush your teeth now and brush your tongue like you normally do. Then take a spoon and drag the spoon over the surface of your tongue to remove the biofilm that your toothbrush didn’t budge. We promise you, you’ll never think that brushing your tongue is sufficient ever again. That said, once we’ve removed the biofilm from our tongues, then the toothbrush can be very helpful in step two, lowering the population of bugs living in the surface of our tongues. You see, the tongue is a really varied surface covered with lots of taste buds which gives the tongue the rough, uneven texture. This uneven texture is an AWESOME surface for bugs to lay down their biofilm and have a party. So, step one is to remove the biofilm. Step two is to lower the population of stink bugs on our tongues. We do this by brushing a natural antimicrobial on the surface of the tongue. You can use many solutions to help with this. Just be sure that what you use has 100% of the ingredients in the formula to help you navigate to greater oral health and not just to fill a bottle. It’s an unfortunate reality that we have to read labels for our oral hygiene products to make sure that there’s no toxic ingredients or artificial junk in them. Our preferred natural antimicrobial to use to clean our tongues is our Healthy Mouth Blend, but we’re biased. 1. Scrape the biofilm off the tongue using a spoon or tongue cleaner designed to perform this important step. 2. Brush a natural antimicrobial over the surface of the tongue using your toothbrush to lower the population of stink bugs living on the tongue. Simply put a drop of Healthy Mouth Blend on your brush and get the bristles to wiggle in between all the nooks and crannies on the surface of your tongue. 3. Then simply swish your mouth with water and you’ll find that you just massively reduced any persistent bad breath for hours! If you’d like to watch a silly, quick video that details this process, just click the video below. If you are new to our products and would like to give this ultimate bad breath elimination technique a try, our OraWellness Starter Kit is the ideal place to start. The Starter Kit provides you with one of our awesome tongue cleaners, one of our equally awesome specially designed Bass toothbrushes, and a bottle of our Healthy Mouth Blend. If you and your partner want to optimize your oral health together, check out our Starter Kit for Couples. If you want to take your oral health to a new level, you may want to check out our Starter Kit Complete, which includes the Starter Kit products AND a pack of our favorite floss and pH test kit. If this solution doesn’t quickly stop bad breath in your life, you may be dealing with another common cause of halitosis, advancing gum disease. Thankfully, the path to stop even advanced gum disease is known. We have thousands of thrilled, happy customers around the world who have stopped advanced gum disease in their own mouths using our Healthy Mouth System. For even more tips on how to get rid of bad breath, feel free to download our FREE eBook, What to Do When You Absolutely Must Have Fresh Breath. As always, if you know someone who could benefit from this information, we realize it may be uncomfortable to share it with them due to the sensitive nature of bad breath, but we appreciate your willingness to share this article with them. Having persistent bad breath can undermine our confidence so much, if reaching out to a loved one with this information can offer them an easy solution, it’s worth it.